Frances is a 2015 filly by Con Capilot out of Danka Shane. Born 4/21/2015 Frances is a dashing looking gal with lots of chrome. She is the half sister to our accomplished stallion, Thanks for the Gold. Frances is handled daily. She stands quietly in the cross ties, loads in trailer, stands for farrier. She is branded Westphalian. Frances would be a prospect for any of the sport horse disciplines. She has a great foundation for you to take her in the direction you wish to take her. Frances' dam had multiple championships in the pre-greens and adult amateur divisions in AA shows. Frances should mature to better than 16 hands. The last photo is of Frances' dam and sire. 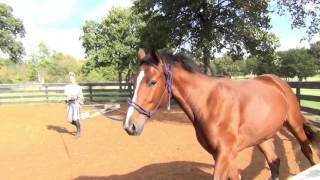 Frances is branded Westphalian, is microchipped and has a life time registration with USEF.